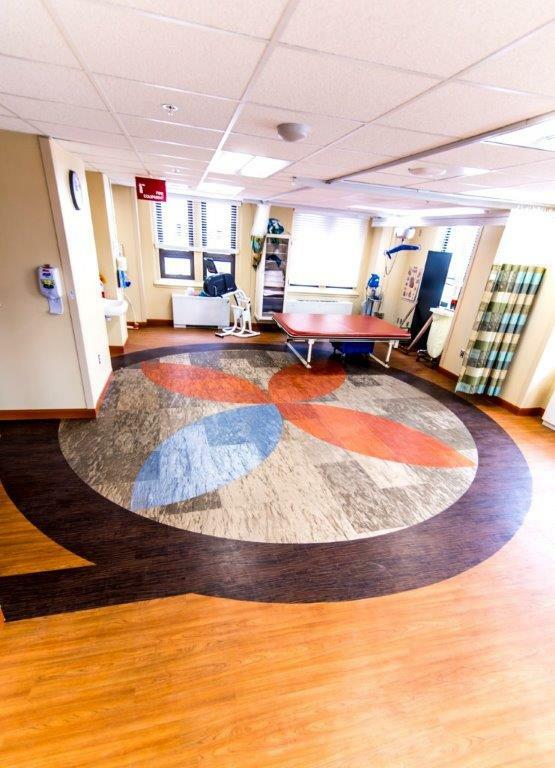 The Department of Veterans Affairs and MasterCraft Flooring have worked together on multiple projects over the course of several years. 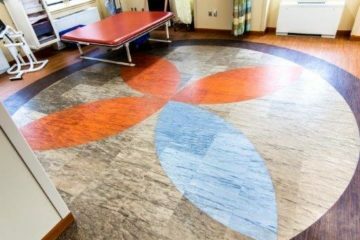 When MasterCraft was awarded the bid through a local contractor joint venture, to handle a sizable flooring installation in the Veterans Rehabilitation Clinic in Ann Arbor, Michigan, it wasn’t the first time they crossed paths on a job site. The project-at-hand spanned two floors requiring a total of 31,000 square feet of flooring. With a plan for intricate patterns, colors and a broad scope of materials, the VA designers in conjunction with interior designers from the Albert Kahn architectural firm, sought to create the feeling of walking into a hotel space as opposed to a clinical facility. 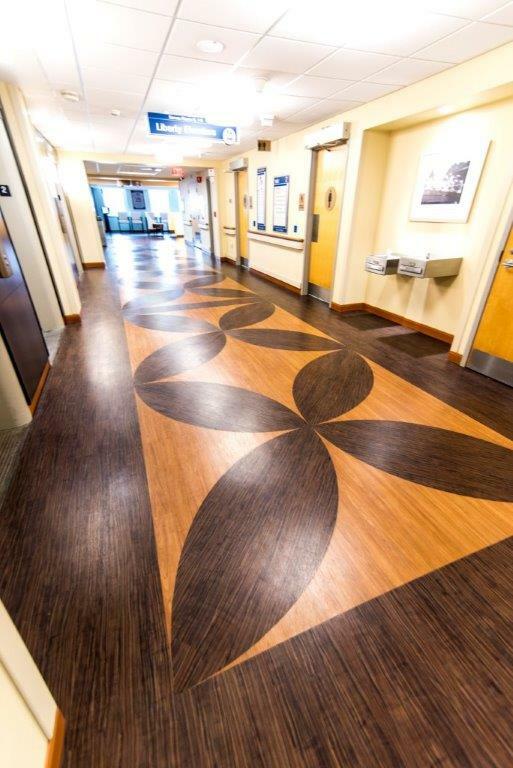 This meant evolving every floor from its 80s-era look and feel to a modern, yet timeless design using materials that were durable, safe for patient care and wouldn’t date the facility. 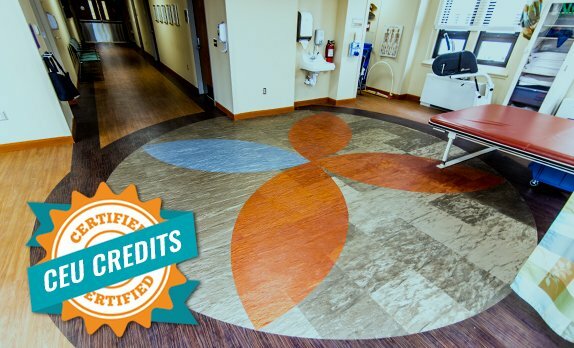 Contractor Addon/Brix awarded this VA flooring installation to MasterCraft. To be awarded a VA project, especially one of this size and complexity, MasterCraft had to demonstrate over previous 5-6 years, what it means to have an INSTALL Warranty Contractor perform installations. 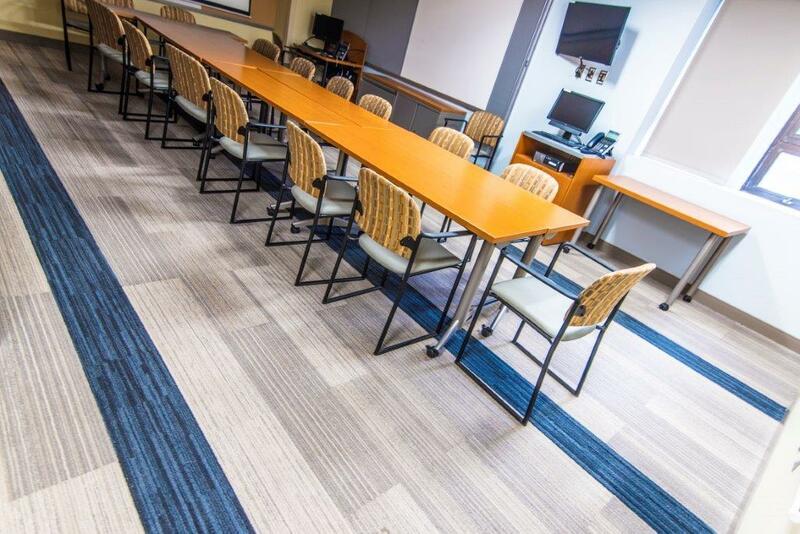 INSTALL, the International Standards and Training Alliance, operates the highest level of training and certification in the North American floorcovering industry. 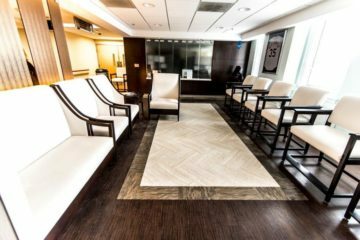 The quality of its programming is such that the Department of Veteran Affairs recently implemented INSTALL certification standards into its Section 09 68 00 Carpeting, Section 09 65 19 Resilient Tile Flooring and Section 09 68 21 Athletic Carpeting Master Specifications. 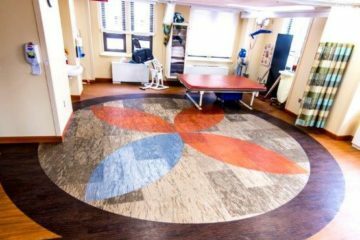 This specification language underscores the Department of Veteran Affair’s determination that only a flooring contractor who employs an INSTALL certified workforce is qualified enough to perform work for the VA, the single largest government employer in the United States. 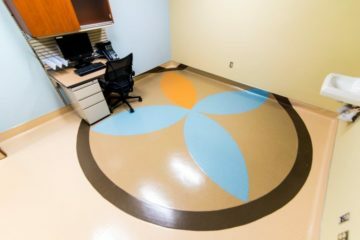 Aside from the complexities of completing a flooring installation in a healthcare environment, the design of the space called for a laundry list of flooring material to boot. Specified products included 1,300 square yards of Interface carpet tile, 11 different Armstrong resilient sheet vinyl products, five colors of flash cove and caps, 12,600 feet of vinyl plank and vinyl tile spanning three colors, 4,100 feet of rubber tile, 3,000 linear feet of millwork resilient base and 3,000 feet of standard vinyl base. 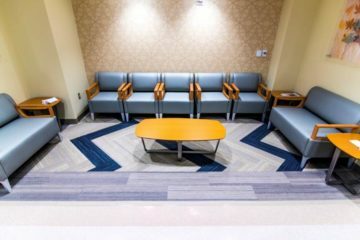 In healthcare settings, especially government ones, design teams tend to be more limited in what they have for material options due to infection control, maintenance and keeping up with the highest level of code standards due to these constraints the walls must be practical. 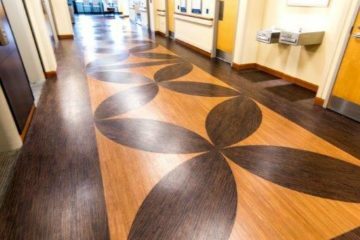 Thus flooring becomes the natural surface for creative output and is often used to breakup long corridors. 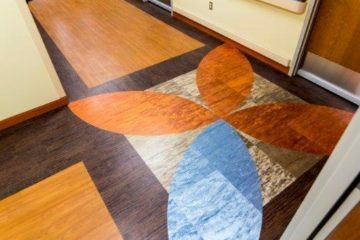 In this case, the design called for incredibly intricate patterns such as leaves and flowers that could only be accomplished with highly skilled professional flooring labor. The patterning was also specifically designed to be used for wayfinding and navigation. 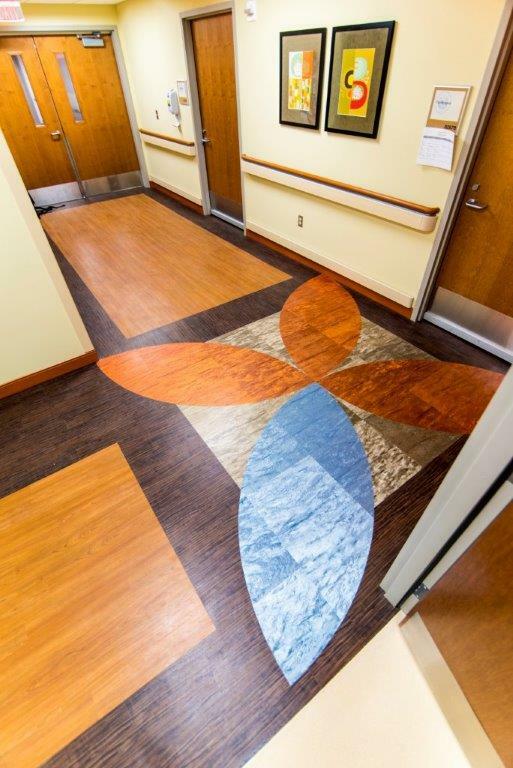 Patient needs played a large role in driving the direction of the design as we’ll. 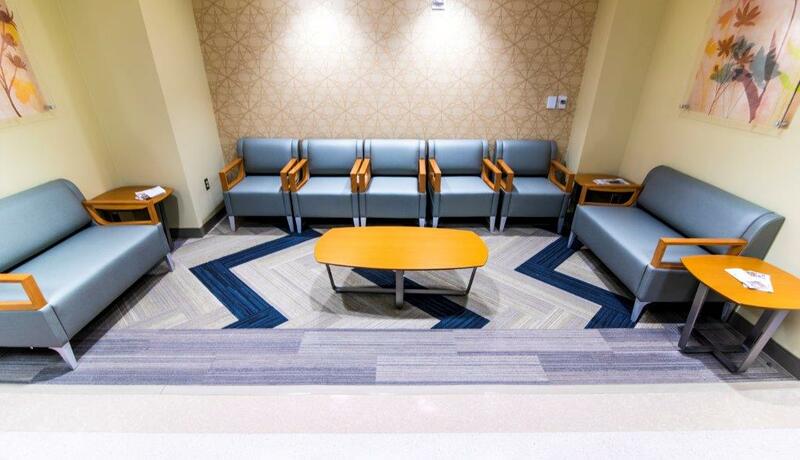 With the majority of patients in an older age group and the need for a calm atmosphere of healing, patterns had to be subtle to the eye. 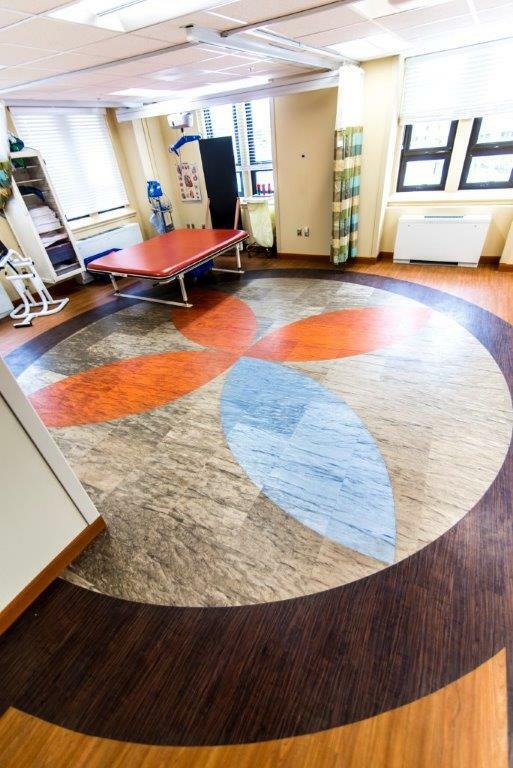 Logistical challenges were presented since this was a renovation of a working hospital requiring off-hour work and closing certain areas during constructions. In a design this intricate, it can be difficult to assign balance and maintain the integrity of the design. This is where MasterCraft, the VA and Albert Kahn made a great team. MasterCraft’s expertise and ability to produce results was largely due to its level of training and certification through INSTALL as well as the business opportunity afforded by being an INSTALL Warranty Contractor. As one of the most endorsed training programs in the United States, INSTALL provided MasterCraft installers the knowledge and experience to handle this level of intricacy as well as working knowledge of every type of material specified. As a result, the VA was extremely satisfied with the completion of the project.